Ann Arbor firefighters - from left, Matthew Hughes, Danielle Lalonde and Phil Smith - stand outside Station No. 1 on Fifth Street after returning from a call Tuesday evening. Before he turned in his badge and hung up his hat, Fire Chief Samuel Hopkins told Ann Arbor firefighters he'd pray for them. "During these tough economic times, it is difficult to make up for the poor administrative decisions that were made during more prosperous periods," Hopkins wrote in a Sept. 10 e-mail to the entire city fire department. "Therefore this city finds itself in financial difficulties," the chief continued. "In order to salvage the budget problems, the decision makers are planning to ask our members to sacrifice so that this city can attempt to recover economic stability going forward. In leaving, I pray that your safety and the safety of this beautiful city isn't part of the casualties of your sacrifice." AnnArbor.com received more than 400 pages of e-mails sent to and from Hopkins between Sept. 6 and 19, the last two weeks of his four-year stint as fire chief. The records, obtained Tuesday, came in response to a Freedom of Information Act request submitted Sept. 28. Hopkins hasn't returned calls from AnnArbor.com since announcing his retirement. But his e-mails add credence to rumors that the chief, who was well-respected within his department, left partly because he was frustrated with budget pressures in city hall. City Administrator Roger Fraser has proposed laying off 14 firefighters to address an expected budget deficit for 2010-11. "The proposal to lay off 14 people is included in the budget plan for July of next year and that's still true," Fraser said. "We have requested that the fire department give us some cost reduction strategies that don't involve the layoff of firefighters and so far we haven't gotten much from them that does enough to mitigate even saving one position." Fraser said he didn't think the proposed cuts directly pose a safety threat to firefighters or residents. "There's nothing about the amount of staffing that directly relates to the safety of firefighters. It's all in how people are used on the scene of a fire," he said. "I know that that's a common plea when discussions are made about possible reductions, but the fact is that that's all in the hands of the people who are managing the scene." 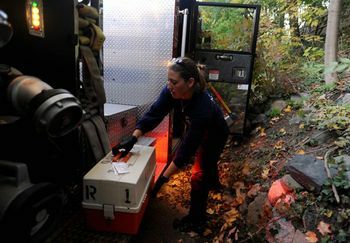 Ann Arbor firefighter Danielle Lalonde loads a kit back onto the truck after responding to an injury call. As contract negotiations continue this week between the firefighters' union and city leaders, interim Fire Chief Greg Hollingsworth said morale in the department has been low. That's especially true for firefighters with low seniority, he said. "They've all got families to worry about, so morale is an issue right now," Hollingsworth said. A Facebook group called "Support the Ann Arbor Fire Department" was formed last week by what appears to be an employee of the department. It calls for a citizen response to the proposal to lay off firefighters and warns council members a vote against public safety "could end up being a vote against them come election time." 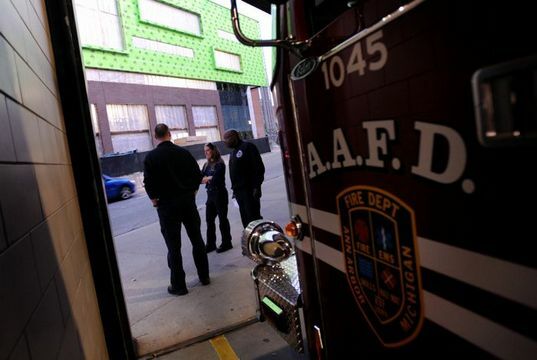 Matt Schroeder, president of the firefighters' union, said the layoffs would impact the fire department's ability to provide acceptable service and Ann Arbor already is ranked below the standards set by the National Fire Protection Association. He declined to comment further, saying it's too sensitive an issue right now. Tom Crawford, the city's chief financial officer, said the fire department has been asked to cut $1.4 million from its budget before the next fiscal year, which begins July 1. Crawford, who recently predicted a deficit as high as $5.8 million in next year's budget, said he plans to give an updated financial forecast to the City Council in November. This isn't the first time the city has proposed laying off firefighters - nor is it the first time firefighters have battled back with a public campaign to save jobs. The most recent round of layoff talks came in 2007, when the city proposed laying off three firefighters and leaving three vacant positions unfilled. By that time, the city had already cut the budget for six years straight. Despite several rounds of layoff talks, no firefighter layoffs have occurred. In the meantime, the fire department is watching its budget carefully and growing more frugal. An annual community open house scheduled for this coming weekend has been canceled in an effort to save the $5,000 to $7,000 it cost in the past to put on. In its place will be a smaller event at Station 6, 1881 Briarwood Circle. The station will be open to the public from 1-4 p.m. Sunday for anyone who wants to stop in, but there will be no festivities. "We're trying to find a few thousand here and a few thousand there to do what we can," Hollingsworth said. "We're working on trying to find any and all kinds of dollars we can use to offset some of these jobs." The fire department currently operates on a budget of about $14 million a year, the bulk of which goes to wages and benefits for firefighters. The department has 94 full-time employees, which includes two management assistants and the chief; the rest are in the firefighters' union. In 2001-02, the department had 113.5 full-time equivalent employees. Hollingsworth said the clock is ticking for the fire department to come up with creative ways to cut costs, and at this point, it may be hard to avoid layoffs. "A lot of our costs are personnel costs, so outside of personnel costs, we don't have a million dollars over and above that to actually cut," said Hollingsworth, who was assistant fire chief prior to his promotion. He said the looming cuts present a threat to the safety of Ann Arbor residents and firefighters. "If we end up losing some of these firefighters, obviously we're going to have to reduce the number of trucks we have in service and potentially close a station," he said. "Response times are going to get longer, we're going to have to consolidate some stations, and that'll be a big thing."